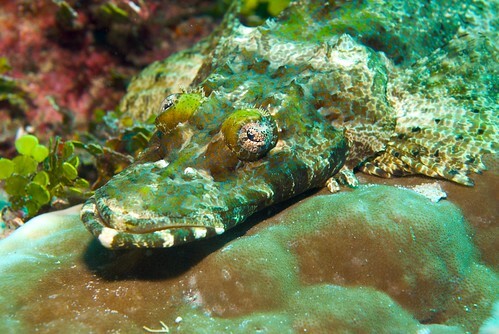 Forlorn Crocodile Fish, originally uploaded by BlueBeyond. I stumbled across this rather forlorn looking crocodile fish at a divesite called Binusa, near Uepi in the Solomon Islands. With my 60mm macro setup, I used the opportunity to focus in on the fish’s eyes and mouth, composing left-to-right, and using a diagonal composition.